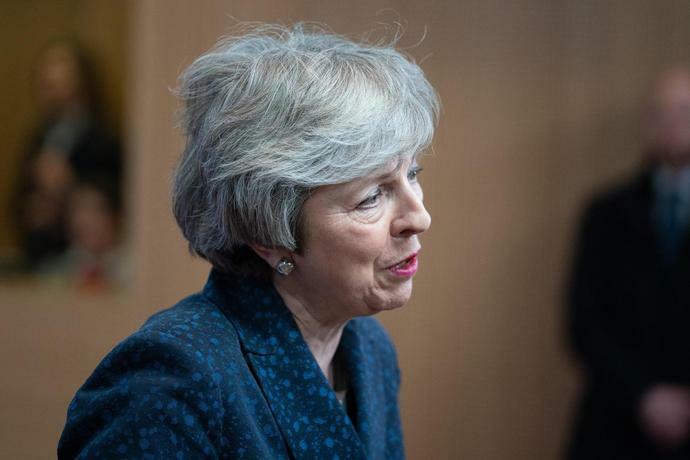 (Bloomberg) -- Theresa May heads to Dublin in the latest effort to extract concessions from the European Union that will make her Brexit divorce deal more acceptable to Parliament. A trip to Brussels on Thursday yielded little though both sides agreed to send their negotiators back into talks. Irish Prime Minister Leo Varadkar met with DUP leader Arlene Foster and her deputy Nigel Dodds in Belfast on Friday for a "wide ranging discussion," the party said in an email. Foster said a deal is possible, but her party will test any new draft "against its impact on the union" before deciding whether to back it. "It was important for the Taoiseach to understand that the views of unionists cannot be ignored," Foster said, referring to Varadkar's official title. "The EU must respect that, for unionists, a new border east-west is no more acceptable than a new border north-south." The head of the U.K.'s civil service negotiating team on Brexit, Oliver Robbins, will join Theresa May and her Irish counterpart Leo Varadkar at dinner in Dublin, the prime minister's spokeswoman said. The aim is to build on May's talks this week in Northern Ireland and Brussels. Next week, May's team will set out a timetable for further discussions with the EU and who will be involved, Alison Donnelly told reporters, and Brexit Secretary Steve Barclay will discuss alternative arrangements for the Irish backstop with the EU's chief negotiator, Michel Barnier, on Monday. German Finance Minister Olaf Scholz made clear the European Union is backing Ireland in the struggle to reach an agreement over the border with the U.K.
With no breakthrough in sight seven weeks before Britain plans to leave the bloc, Scholz said the current impasse and the lack of clarity on London's position makes him "nervous" that a disorderly Brexit may be hard to avoid. "The most difficult political question is the border between Northern Ireland and Ireland," Scholz said in a speech at Bloomberg's European headquarters in London. "It's clear that the EU is supporting Ireland," and the current agreement is "fair" for both sides. John McDonnell, economy spokesman for the opposition Labour Party, insisted that a letter from leader Jeremy Corbyn laying out demands for Brexit was a genuine attempt to reach a compromise with Prime Minister Theresa May. "We're saying these are our proposals, we're happy to meet again with the prime minister to talk this through," McDonnell told BBC Radio 4's Today program. "We've gone beyond party politics now, it's about parliamentary majorities and individual MPs thinking about what's best for their constituents... Not everyone's going to get everything they want." McDonnell said Corbyn's proposals -- a permanent customs union, close alignment with the EU single market and guarantees on workers' rights -- could form the basis for a majority in Parliament. He said Labour is still holding out the possibility of a second referendum, after protests from Labour members who were angry that Corbyn's letter didn't mention it. "People have looked over the edge of a no-deal Brexit and it could be catastrophic for our economy,'' McDonnell said. "In the national interest we've got to come together and try to secure a compromise, if we can't do that we have to go back to the public." --With assistance from Birgit Jennen and Robert Hutton. LONDON (AP) - Police in Northern Ireland on Saturday arrested two teenagers in connection with the fatal shooting of a journalist during rioting in the city of Londonderry.